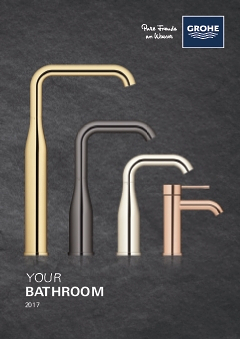 GROHE Eurocube is a unique fusion of sharp modern design and luxurious performance. With its clear-cut cuboid shape, this single-lever mixer makes a stunning addition to your bathroom and offers a variety of cutting edge functional features. Water temperature and volume are easy to control with a lever that moves smoothly thanks to our GROHE SilkMove ceramic cartridge. Finished in our dazzling and scratch resistant GROHE StarLight chrome, it has a sparkle that will last for many years. The GROHE QuickFix Plus system even ensures a quick and hassle-free installation. With its classy, understated design and functional perfection, this tap will add style and convenience your bathroom. An easy yet sophisticated upgrade!